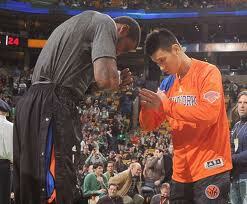 #knickstape » Knicks were ready to match; with handshake to trade Lin before February! Knicks were ready to match; with handshake to trade Lin before February! The Knicks were still deliberating their decision in recent days, and there was no better sign of that fact than one of the team-to-team discussions they engaged in over the weekend. New York, according to sources, was considering matching the offer for Lin while also finding a handshake agreement with another team so that it could, if it so desired, deal him before the February trade deadline as part of a contingency plan. In those discussions, the Knicks — whose acquisition of Raymond Felton was the most obvious sign that Lin was on his way out — had targeted specific point guards with whom they could swap Lin as a way to maintain depth at the position behind Felton and another newcomer, Jason Kidd. All along I thought they would sign Lin, and that seems partially correct. Knicks were ready to flip Lin to another team if they would agree on a handshake under the table type of a deal before February’s trade deadline. Looks like there weren’t many bidders or buyers for Linsanity! In my honest opinion I would have re-signed Lin, hoped for a Lin-tastic season and flipped him along with Stoudmire next July to the Rockets! I can dream can’t I?